I’m not sure how many of you are familiar with the Wisconsin State Fair, but I think this article, oh and this one, pretty much says it all. My summer is not complete without the Wisconsin State Fair. State fair park is my Mecca. I live for the state fair. Among all those deliciously fattening foods on a stick and the cheeseburger stuffed between a Krispy Kreme donut, the fair also features cream puffs (Oh, how I live for cream puffs! 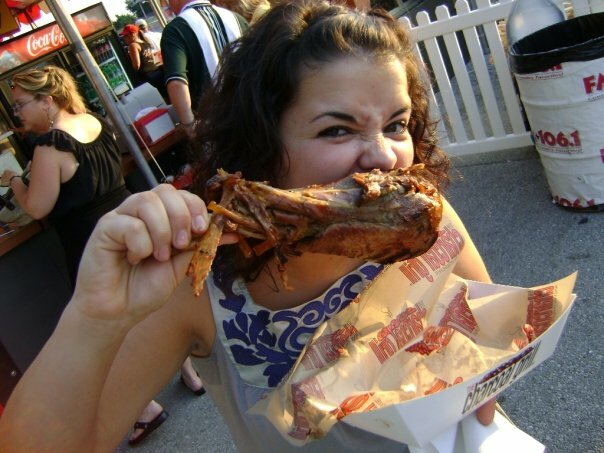 ), amazing corn on the cob, gi-normous turkey legs, grilled cheese featuring the best cheese the Dairyland has to offer, beer from a ton of different Wisconsin micro-breweries, and a variety of flavored milk (including cherry vanilla, root beer, and mocha) at 25 cents a pop. Mmmmm ... turkey legs. This shot was taken last year at the good ole fair. 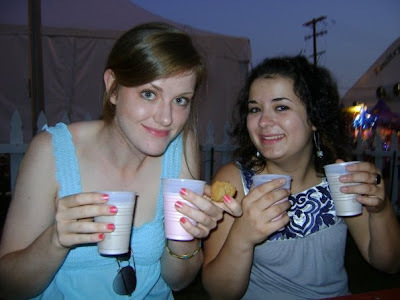 With my good friend, Katy at the fair last year enjoying the quarter milk. Stomach ache always follows. Nothing leaves you feeling better than four glass of flavored, sugary whole milk. Other than food, the state fair offers a ton of shopping opportunities in the expo center (It’s like live infomercials. It’s amazing! 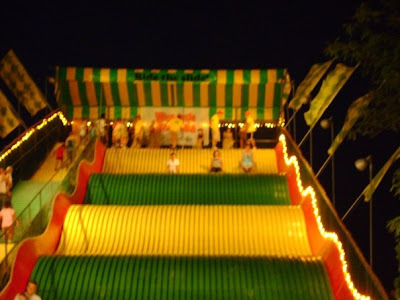 ), a giant slide that you have to do, and lots of animals for us city folk to look at. Riding down the giant slide. Walking up those stairs will be the most exercise I will get that day. I’ve given up a lot of food this summer. I’ve been so good at avoiding custard and brats and other foods that make me think of summer. With that said, I am prepared to do damage this week. So, I am taking the day off of work on Friday to go. Matt doesn’t have to work either, so he’ll be able to go, too. Not only will I be taking the day off from work, but also the day off from dieting. I don’t feel bad about doing it. Months ago I knew this day would come. And I’ve prepared for it. I've worked hard. My original goal was to be down to 125 when the fair came around. I am almost there and am so proud of all the work I’ve put in so far. So, I’m ready to indulge. But, while I’m eating it, I will enjoy it. After all, it will be 365 days until I eat like that again. I will be running a lot this week. I’m hoping to hit 20 miles. I already got 4.5 in last night. I have a busy night tonight, but am going to try to get in a few tonight. I’m also going to skip a weigh in this week and just wait until next Tuesday to survey the damage, which I’m sure there will be lots of. So, until then, I shall be stuffing my face. P.S. Does anyone know how many Weight Watchers points there are in a cheeseburger on a Krispy Kreme donut?